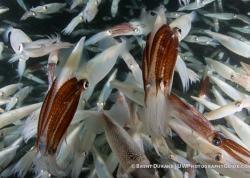 Amazing underwater photography from Anilao. 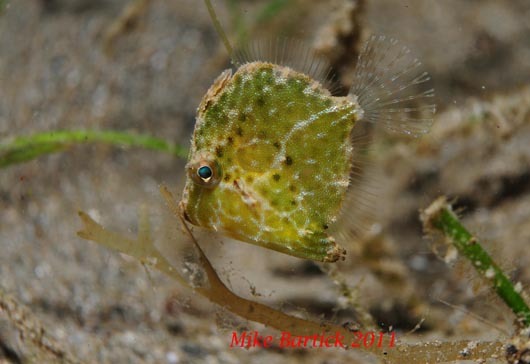 Underwater Photography and Text by Mike Bartick. Video by Walter Marti. 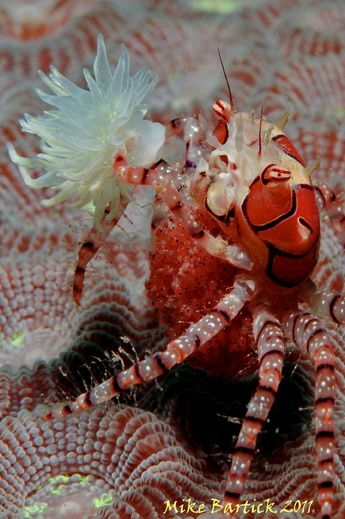 It’s no secret that Anilao is amongst the top three destinations in the world for underwater photography of macro critters. Kimbe bay, Lembeh and Anilao seem to rule the leader board in terms of new animal life, consistent critter finds and certainly some of the most unique animal behavior and mimicry found to date. 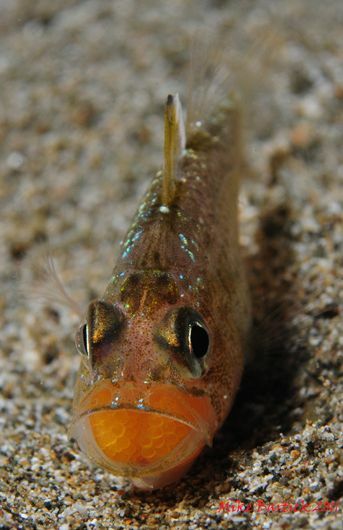 Mimicry prevents detection while masking predation. Nikon D300s, 60mm macro, ISO 200, f/11 at 1/250 sec. 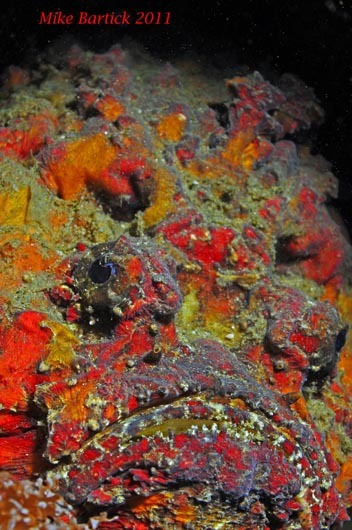 Bizarre and hideous, the deadly Reef Stonefish seems to mimic sponge and stone. They are a perfect example of a lie and wait predator. This particular specimen was at least 10lbs and the largest I'd seen. 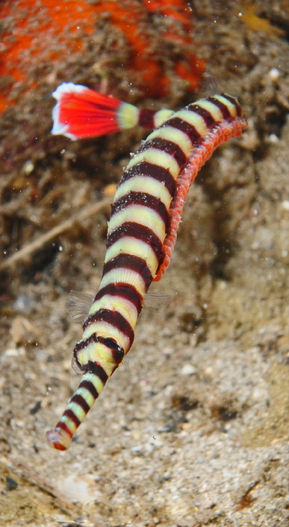 The Bobbit worm on the other hand is an ambush predator. Equipped with chemical sensors, tentacles and sharks tooth like appendages to ambulate beneath the substrate, the Bobbit Worm has a calcified jawbone that will snap shut, like a bear trap on its unwitting prey. 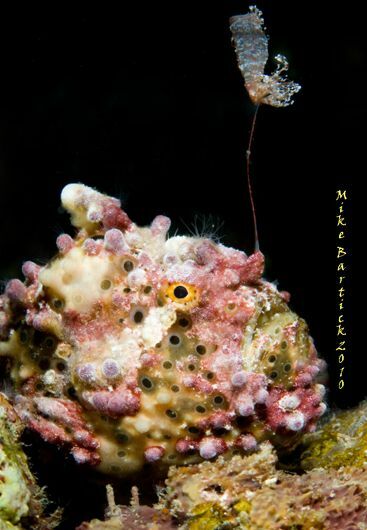 Frogfish are a highly evolved lie and wait predator that uses mimicry to lure its prey close enough to apply its lightning fast strike speeds, sometimes inhaling fish that are nearly the same size as itself. Amazing video of a Bobbit Worm attempting to snare a fish. 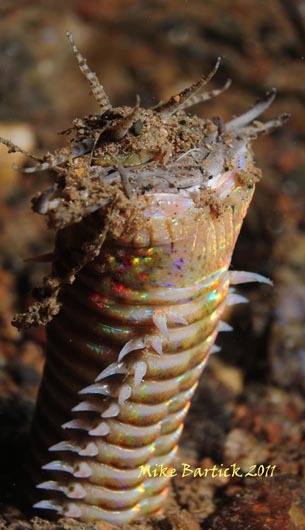 Here's a great Bobbit worm article. Nikon 60mm macro, ISO 250, f16 at 1/320 sec. Video of a Frogfish showing off it's lightning fast strike. Now you see it. Now you don't. 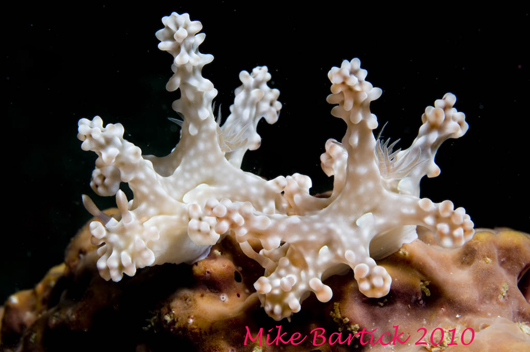 But the best examples of mimicry are the Nudibranchs. 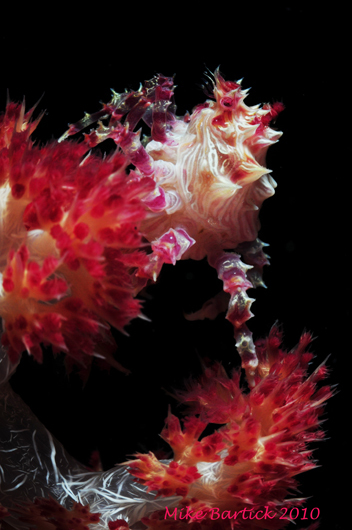 The Ceratasoma alleni and the soft coral feeder like the Marionia are amongst some of my favorites. These ornate little gems are tough to find and some naturalists may spend a lifetime searching them out. Nikon 60mm macro, ISO 320, f/22 at 1/250 sec. Finding a knowledgeable and experienced guide to show you these hard to find creatures is crucial to making your trip productive. It’s important to hire and use the same guide once a good working relationship has been formed. Nikon 60mm, ISO 200, f/29 at 1/125 sec. 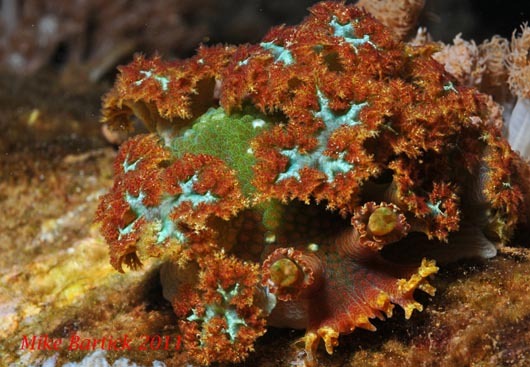 Soft coral crabs can be found on their symbiotic host trapping tidbits of food passing by on the current. 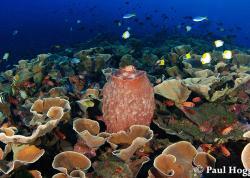 They aren’t on every piece of soft coral, but can live an entire lifetime on the same small coral animal. 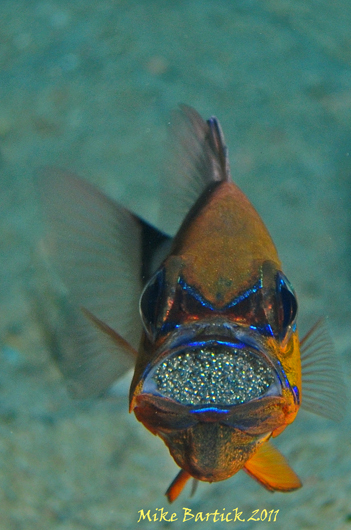 Some of my favorite finds from my recent trips have to be the egg carriers and brooding Cardinalfish. Patience prevails when stalking your subject. Longer lenses can prove helpful but you must provide with more light and higher f-stops to increase the color. Yellow eggs indicate newer, undeveloped eggs. Sigma 28-80mm at 80mm, ISO 320, f/16 at 1/125 sec. Silver eggs indicate more developed eggs. Sigma 28-80mm, ISO 320, f/11 at 1/250 sec. The Peacock Mantis and Mosaic Boxer Crab both clutch their eggs under the carapace for safety. Always under the watchful eye of a concerned parent these eggs are safeguarded until they begin to hatch. Sigma 28-80mm at 80mm, ISO 250, f/25 at 1/125 sec. The Sigma 28-80mm macro does 2:1 magnification at 80mm, not bad. This is a cropped photo. 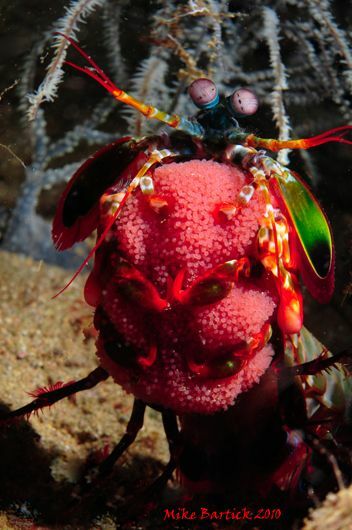 Peacock Mantis Shrimp carrying a clutch of eggs. Nikon 60mm macro, ISO 200, f/20 at 1/200 sec. 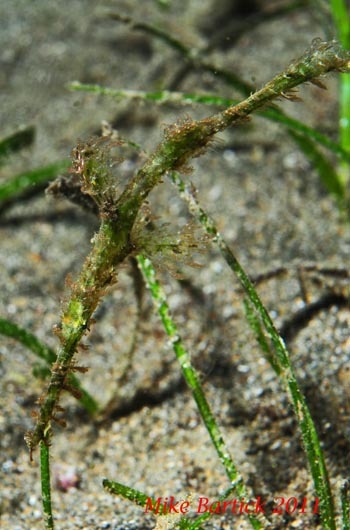 The more common male banded pipefish carries the eggs attached to his abdomen whereas the ornate ghost pipefish male carries the eggs in a small satchel attached under the abdomen, between the two pectoral fins. 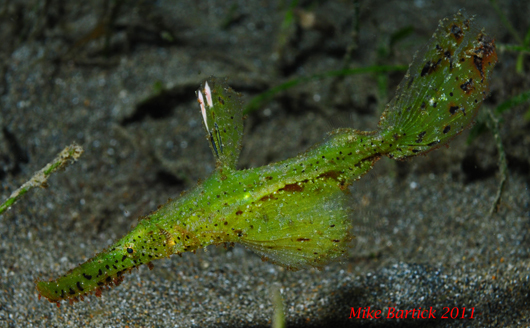 Common Banded Pipefish with eggs. Sigma 28-80mm at 52mm, ISO 250, f/16 at 1/125 sec. 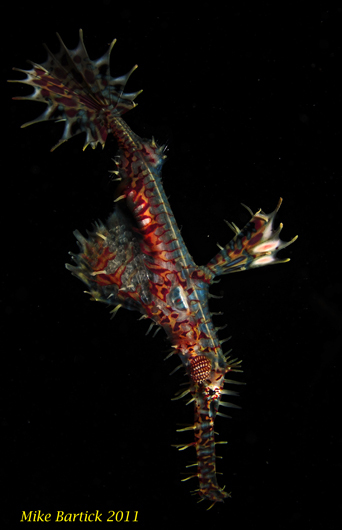 Ornate Ghost Pipefish with eggs. Sigma 28-80mm at 44mm, ISO 250, f/16 at 1/125 sec. Mating is another unique behavior that can be observed almost anywhere but on this full moon in Anilao romance was in the air. These two beautiful bobtailed squid didn’t seem to mind me watching and shooting photos of them. The act only lasted a very few seconds and I am sure someone was a little disappointed at the end. 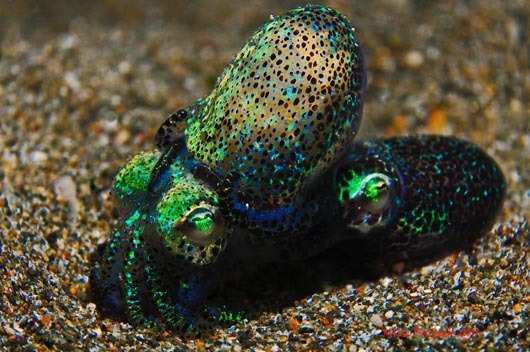 Mating Bobtail Squid or Dumpling Squid. Sigma 28-80mm at 80mm, ISO 250, f/16 at 1/160 sec. Nikon 60mm macro, ISO 320, f/11 at 1/125 sec. 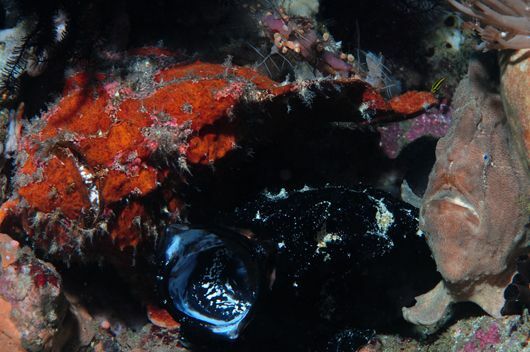 The two giant male frogfish (black and tan) jostle for positioning next to the pregnant female (red). The males take turns pushing down on the females distended abdomen trying to coax her into releasing her eggs. However natures design is perfect. She is waiting for the fullness of the moon and the current to release her eggs. Frogfish are broadcast spawners and the males will swim to the surface with the females and release the sperm simultaneously, fertilizing the 50,000 plus eggs. The eggs will drift with the current, riding along for safety, away from the reef and certain consumption. After a period of time as the eggs develop they will slowly drop to the substrate and newly formed frogfish will emerge. 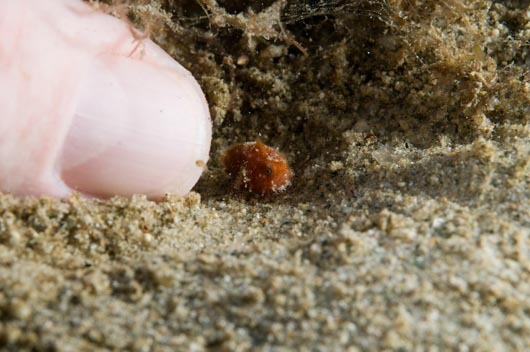 Frogfish hatchling next to my thumb. Nikon 60mm macro, ISO 250, f/16 at 1/160 sec. Mother Nature is simply amazing. She will provide the key for each creature to survive and just as temperate, cull the weak. 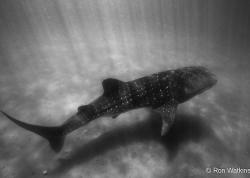 Survival takes on many forms for function and for me there is no other place to observe this occurrence than in Anilao. Submitted by Anonymous on Sun, 2011-02-27 16:22. Very nice. I am going to Anilao in one month's time, and the reports and articles on this site have really whetted my appetite. Submitted by Anonymous on Wed, 2011-04-27 23:41.
which resort did you find best with regards to finding all these muck critters?